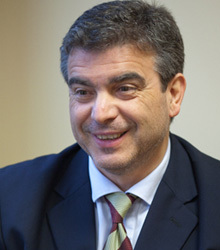 Pedro Videla is professor in the Department of Economics. He holds a Ph.D. and an MA in economics, both from the University of Chicago, and a commercial engineering degree in economics from the Universidad Católica de Chile. His areas of specialization include macroeconomics, international economies and emerging economies. As a consultant Prof. Videla has been involved in projects with institutions such as the World Bank, IMF, EU, the InterAmerican Development Bank, and USAID. He has taught at the Universidad Adolfo Ibánez (Chile), the Roosevelt University (Chicago, USA), and currently teaches economics courses on the MBA program at IESE.